Unter ‘Compiler Options’ the user can adjust the internal DWScript compiler, which is responsible for compiling the Object Pascal source code into an internal representation. 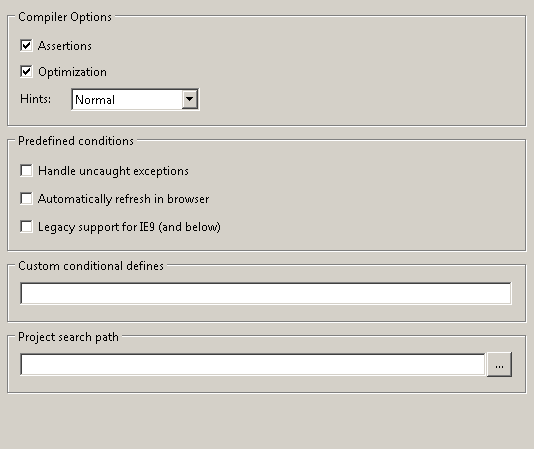 While the DWScript compiler offers a few more options, these are the only ones the user can play with. where the Boolean experession can be something like “SomeValue < AnotherValue” or a function call like “IsValueValid(SomeValue)”. It adds another pass to the compilation, which results in longer compilation times. NOTE: At the time of writing it seems as if this option is not taken into account (even if enabled) in Smart Mobile Studio due to an improper setup. It will be fixed as soon as possible. and will be set at a compiler level (for all units). In addition the linker will output a file called ‘timestamp.txt’ if the ‘Automatically refresh in the browser’ is checked. This will be used to identify if the file has been changed. In addition to the predefined conditions you can specify custom conditional defines. These will add to the compiler and similar to the predefined conditions set at the compiler level (i.E. set in all units). Previously the DWScript compiler options were described. This section now covers the code generation options. These correspond to the DWScript JSCodeGen, which was to some point available as open source. As it hasn’t evolved much in regards of the basic options, you can still find it around if you need more details. With inline magic the compiler will inline the DWScript’s mini RTL functions: AnsiLowerCase, AnsiUpperCase, ArcCos, ArcSin, ArcTan, ArcTan2, Ceil, Cos, Copy, MidStr, Exp, FloatToStr, Floor, Format, HexToInt, Infinity, IntPower, IntToHex, IntToStr, IsFinite, IsNaN, LeftStr, Ln, LowerCase, Max, Min, MaxInt, MinInt, NaN, Pi, Pos, PosEx, Power, Round, Sign, Sin, Sqr, Sqrt, StrBeginsWith, StrDeleteLeft, StrContains, StrFind, StrJoin, StrMatches, StrSplit, StrToFloat, StrToInt, SubStr, SubString, Tan, TypeOf, Unsigned32, UpperCase, VarIsNull, VarIsClear and VarIsArray with direct JS code instead of call them as functions. This typically speeds up the application as typically less code is generated. With ‘Emit RTTI information’ the compiler will output RTTI information. It can be left unchecked if no RTTI is needed. No information available so far. Often methods are declared as virtual, but there is no override used in the source code. In this case it might make sense to unmark it as virtual to improve its performance upon calls. Since it is cumbersome to maintain by hand (especially if overrides are planned to be implemented in the future) and sometimes difficult (if an overrided function doesn’t call the inherited function) to find, this feature de-virtualizes your code. This controls whether source locations are emitted or not. This feature links to the verbosity options. Checks if the function is used at all. If not, it is not generated at all. As a dedicated stage in the code generation process this takes time, but it might be well worth it. In order to work decently, the units shouldn’t have much cross-dependencies. NOTE: This feature still contains a bug for functions that are only called from within a lambda statement. If enabled the code will be packed by stripping empty lines. It is marked as recommended, especially for a release. If enabled the code will be obfuscated by replacing the function names with strings from a random generator. This will make deciphering of the JS source code much harder. It is marked as recommended, especially for a release, when it is important to protect your source. If you want others to read your code, you should of course uncheck this option. NOTE: Class names will not be obfuscated as RTTI or other functions such as comparing the ClassName won’t work. This is important to know as this can be the reason why tools like Google’s closure compiler might not work as expected although it does similar techniques like obfuscation. If ‘Use main body’ is checked the entire code is wrapped into a main function by the compiler. This might or might not necessary depending on the context where you want to use the script. For example the default HTML template already adds another main body, so it might not be needed. Especially for environments where less is more (e.g. microcontroller programming), this just adds an unnecessary overhead. For example the code below will compile and run without complains. As can be seen easily the code is not doing right as the array index clearly exceeds the range of elements. This would result in a hidden issue that can be very hard to locate. With ‘range checking’ enabled, an exception is raised, which points you to the location in the source code where the range is exceeded. This bug will hopefully be fixed in one of the next versions. At the time of writing several issues in the IDE could be revealed. These will (hopefully) be fixed and the article will be revised in the future. This also includes items that are not yet described perfectly clear in this article. The bug mentioned at the end of the article (about dynamic arrays being not properly checked) will be fixed with the next hotfix.